Do you enjoy keeping your feet dry? Unless you are swimming or taking a shower, it is generally a good idea to keep your feet dry. Yes, we understand that it is not bad for you to get your feet wet, but it is not the best idea for super long periods of time. There are better ideas than to simply walk around in a pair of wet shoes. Rain is liquid water in the form of droplets that have condensed from atmospheric water vapor and then precipitated (become heavy enough to fall under gravity down to the earth). It would be pointless to get mad at the rain, because it is clearly a major component of the water cycle and is responsible for depositing most of the fresh water on the Earth. It provides suitable conditions for many types of ecosystems, as well as water for hydroelectric power plants and crop irrigation. More importantly, it provides the proper liquid for us to continue our life on earth. With that said, it is fair to say that the rain is sometimes a pain in the neck. Most definitely when it messes up our clothing and footwear choices for the day. What should we do on a rainy day? Maybe putting on a pair of rain boots would be a good idea. A boot is a type of footwear and a specific type of shoe. Most boots mainly cover the foot and the ankle, while some also cover some part of the lower calf. Some boots extend up the leg, sometimes as far as the knee or even the hip. Most boots have a heel that is clearly distinguishable from the rest of the sole, even if the two are made of one piece. Traditionally made of leather or rubber, modern boots are made from a variety of materials. Boots are worn both for their functionality of protecting the foot and leg from water, extreme cold, mud or hazards. Boots can also be worn simply because they are stylish and balance off our outfit in certain circumstances. Rain boots are a type of boot specifically made for those annoying rainy days. They are also beneficial for the days after the rain when everything is still wet & mucky. Rainboots can be traditional in solid colors or with a wide variety of printed patterns. 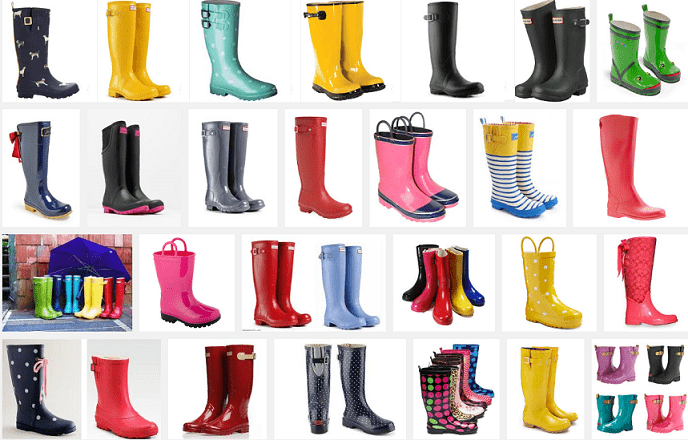 Parents seem to love putting their kids into rainboots. This is probably because children have an uncanny enjoyment from jumping in every puddle they can find. The fashion savvy enjoy just about any type of shoe. Why would rainwear be any different? If you ask any serious fashionista about their boot collection, they will most likely inform you that they have at minimum one pair of trendy rain boots. Outdoor enthusiast are also huge fans of shoes that are capable of handling wet conditions. An outdoor enthusiast is a person who enjoys sports and activities in nature and wilderness areas. Interests associated with outdoor enthusiasts include hiking, fishing, hunting, cross-country skiing, snowshoeing, canoeing, climbing and camping. Much of these activities will transpire in rainy or wet conditions. So, if you are a backwoodsman, child, fashionista, or outdoorsman you will most likely at some point have a need or desire to own a pair of rain boots. Bean Boots (officially called Maine Hunting Shoes) are a type of duck boots manufactured by L.L.Bean. They are constructed from a rubber sole and a leather upper. The boots were created in 1911 and were an instant success. In the 2010s, the boots experienced a resurgence in popularity. This style of boot is now manufactured and sold by many different companies in the footwear industry. The Wellington boot is a type of boot based upon leather Hessian boots. They were worn and popularized by Arthur Wellesley, 1st Duke of Wellington. This novel "Wellington" boot became a staple of hunting and outdoor wear for the British aristocracy in the early 19th century. Snow boots have many of the same properties and benefits of rain boots. Winter boots are often waterproof, and are typically made for cold weather climates. Rain boots can be designed and manufactured in multiple versions. Some styles can be produced in ways so that they are specific for warm, moderate or cold climates. What should be worn with rain boots? It is not a requirement but rainwear to cover other areas of your body would not be a bad idea when it is raining or snowing. A raincoat or slicker is a waterproof or water-resistant coat worn to protect the body from rain. The term rain jacket is sometimes used to refer to raincoats that are waist length. A rain jacket may be combined with a pair of rain pants to make a rain suit. Modern raincoats are often constructed of breathable, waterproof fabrics such as Gore-Tex or Tyvek and coated nylons. These fabrics allow some air to pass through, allowing the garment to 'breathe' so that sweat vapour can escape. The amount of pouring rain a raincoat can handle is sometimes measured in the unit millimeters, water gauge. Why are rain boots yellow? Obviously not all rain boots are yellow. But the reason that many are yellow is because when it is raining outside it is generally hard to see (yes, they rain gets in the way of your line of sight). So, if you are wearing yellow rain boots while walking down the street or riding a bicycle, it is more likely that a driver will see you. Certainly it is not a guarantee that yellow rain boots will protect you from getting hit by a car, but it certainly can’t hurt to be more visible. Rain boots of any color are exciting. Some people may consider them the most intersting types of shoe. Can you think of a more interesting type of footwear?